Not all music listeners and digital consumers are the same. It's an obvious thing to say, but in what ways do they differ? Are there any groups or patterns of behaviour among them? Youth subcultures are well known. Is it just my London perspective, or do people in the UK revel in the finer points of 'tribal' distinctions more than anywhere else? Channel 4 recently launched the UK Tribes website, dedicated to mapping the current groups here, from established subcultures like goths and grungers to myspacers, Nathan Barleys (explanation for non-UK readers) and blingers. However, this is a scattershot picture that doesn't give much sense of how the different tribes align and interact with each other. In my book, I'm interested in the dynamics that drive word-of-mouth recommendations, including the types of people that make a point of spreading the word. The most useful data I've found has been published by Emap Advertising and is again UK-based (Emap owns several magazines and radio stations). In 2003 they did a first research study, under the name Project Phoenix, looking specifically at the attitudes towards music of people between the ages of 15 and 39. They identified four main degrees of interest in music. I'm looking at patterns in how people collect different media, and how collecting relates to repeat listening/viewing/using. 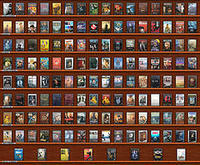 In the UK, estimates of the average number of CDs in a collection vary between 126 and 178 for men, 135 for women. Are there any similar figures for DVDs or games, or for US markets? I'm still looking. So how do people find out about all this material? How do they judge what they might like? I'm writing a book that addresses these questions. 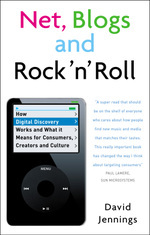 The title is Net, Blogs and Rock'n'Roll: Who knows what's next in media and music in the new era of digital discovery and the download culture (the lengthy subtitle may change). It will be published in 2007 by Nicholas Brealey Publishing, UK publishers of John Battelle's The Search and many other titles on digital enterprise and learning. I signed the contract today and registered the domain netblogsrocknroll.com.